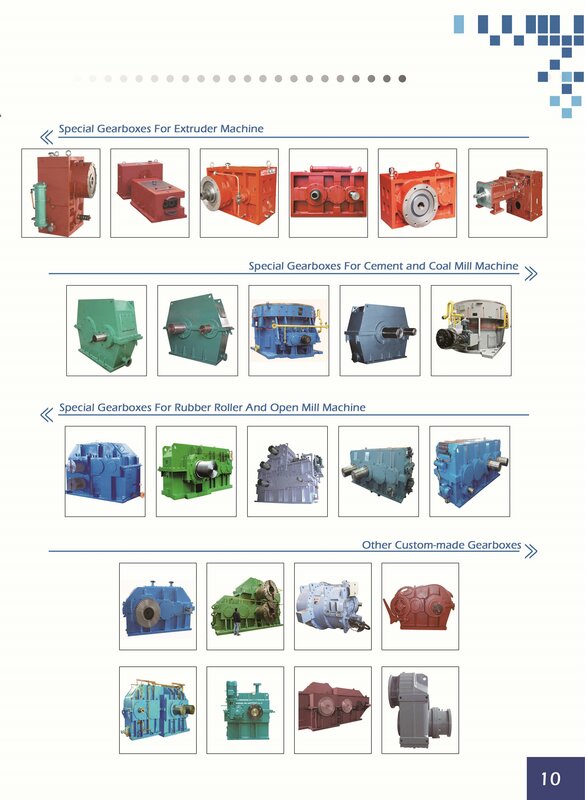 We are your one-sourcefor your plastic extruders needs. Plastic extruders are used to make pipes, siding, plastic sheets and awide variety of other end products. ZLYJ reducers are a kind of high-precision rigid gear assembly specially designed for the single-screw plastic/rubber extruder. We are your onesourcefor your plastic extruders needs. Plastic extruders are used to make pipes, siding, plastic sheets and awide variety of other end products. Taking the JB/T 8853-2001 Cylindrical Gear Reducer as a reference for design, the products applies the high-strength low-carbon alloy steel for gears and gear shaft, with tooth flank carbureted, quenched and ground, to meet the gear precision at Level 6 (GB/T 10095) and hardness of tooth flank HRC54~62. A huge thrust bearing is mounted on the front of the output shaft to bear the thrust from the screw. 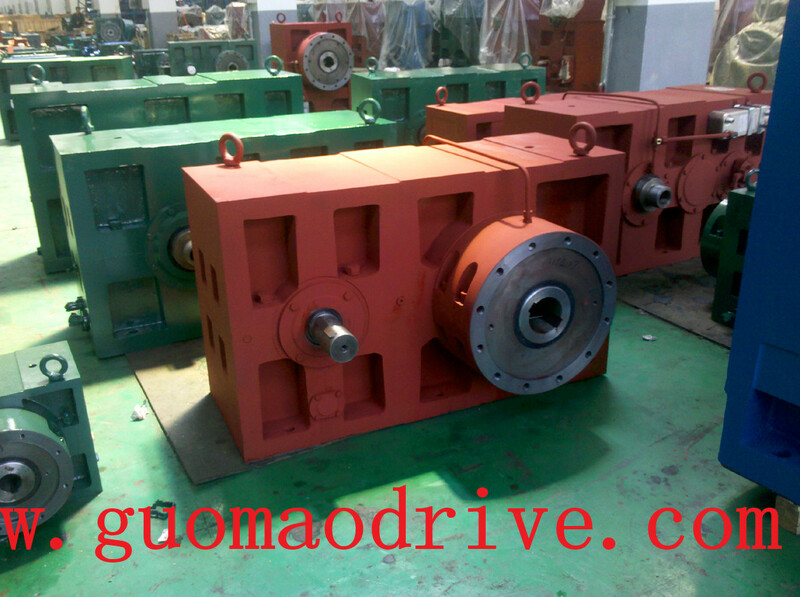  The input rotation of prime mover shall be ≤ 1500 rpm.  The peripheral speed of gear drive shall be ≤ 20m/s.  The working ambient temperature shall be within -40℃~45℃. Preheat the lubricating oil to above 0℃ or choose the low temperature lubricating oil when the ambient temperature is below 0℃.  Rotation is available both forwards and backwards. 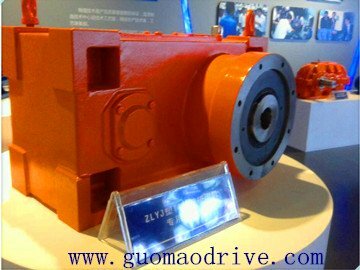 However, the high-speed shaft of some types of reducers has a single-way oil pump directing as defaulted to the output shaft which rotates clockwise. Product nameplates: When delivered, all reducers are attached with nameplates to specify the type, capability, production date, ex-factory number and other features for the purpose of maintenance, which shall not be removed at random.  Make sure the installing foundation of reducer is level, secure and stable. Carefully lay out the installation in special working environment. When all anchor bolts are evenly tightened, ensure that the screw inserted into the output shaft turns freely and regularly.  Error compensation connection shall prevail in respect of the connection of reducer to prime mover. Ensure the concentricity of the connecting part of the axial midline of reducer’s input shaft. Check the axial deviance and angular displacement, the deviation of which two shall be within the allowed value of the coupling applied. 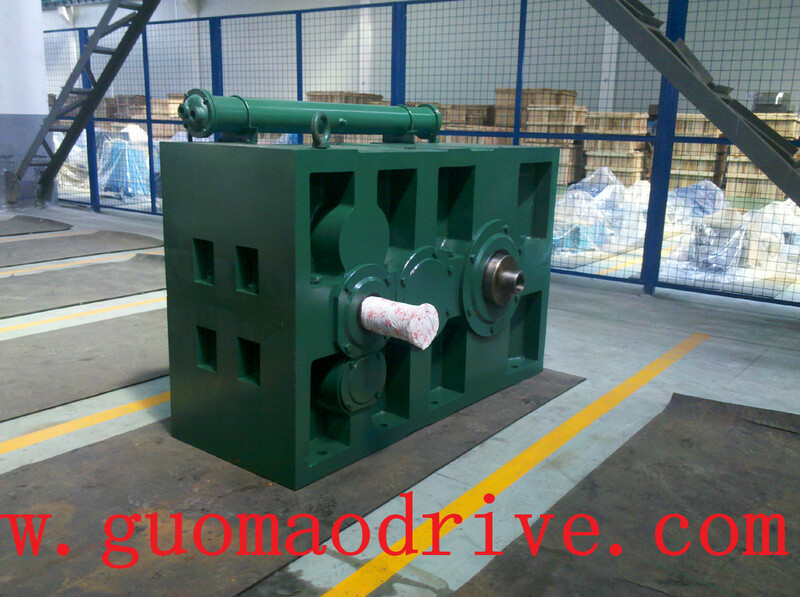  Check the additional radial durability of the shaft of reducer according to the product sample on condition that the belt wheel, gear and chain wheel are used to input and output the driving force of reducer. At the middle part of the input shaft, the additional radial force shall be no more than (N), in which the input moment of reducer (N.M).  After installation, fill into the reducer the lubricating oil until reaching the center line of oil pointer when evenly distributing.  Connect to and turn on the water cooling system to check whether the joints bleed or leak.